Finally, someone closes the gap. It’s true that not everyone needs to boost all five major frequencies used by cell providers. Not everyone needs to boost 4G, AWS, and LTE. For those who do, however, there’s been a gap big enough to drive a cell tower through. 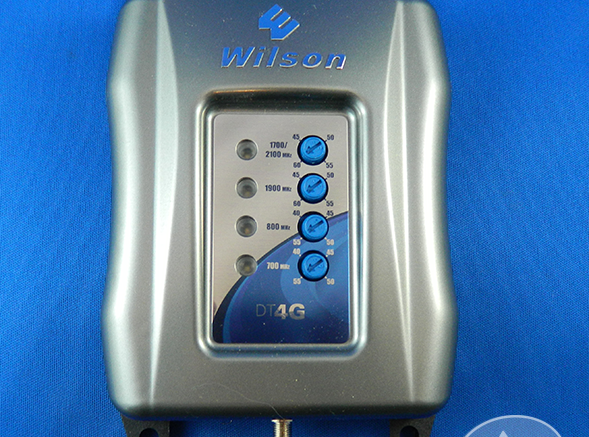 On the low end, you could choose the Wilson Sleek 4G series of boosters. They’re really designed for the car, so the range isn’t really what you need for a small office. On the other hand, if you really need to get serious, you could build your own system starting with a booster like Wilson’s AG-PRO-QUINT and add the antennas and cabling you need. Small office and home office users were left in the nether region between these two. If you wanted both voice and 4G/LTE, you were forced to combine multiple boosters for a less desirable, yet still expensive, experience. Those days are over. 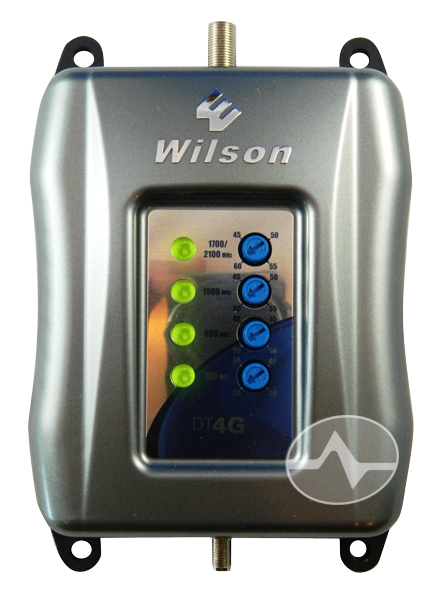 Solid Signal is proud to introduce the Wilson Electronics DT4G quad-band signal booster. 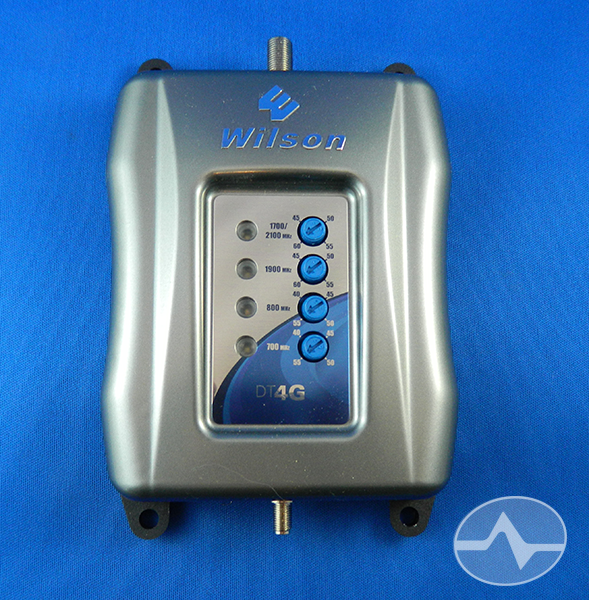 This is a brand new product from Wilson that combines the low cost and easy installation of the SignalBoost DT series and adds the power of the AG-Pro-Quint for the first consumer-level 5-band booster that can handle any frequency, any carrier, any type of transmission. It’s the ultimate future-proof booster and only Wilson makes it. This review is available in PDF format for your mobile device! Download it now! Note: Our test unit was a prototype. Not everything included in our review material may be included in the final retail kit. Note that it has four indicator lights and four adjustment screws, for 700, 800, 1950, and 1700/2100 MHz. Normally you would not need to adjust the power level down from maximum but it’s nice to have the option in case you are limited in where you want to place the antenna. It also is easily wall-mountable. 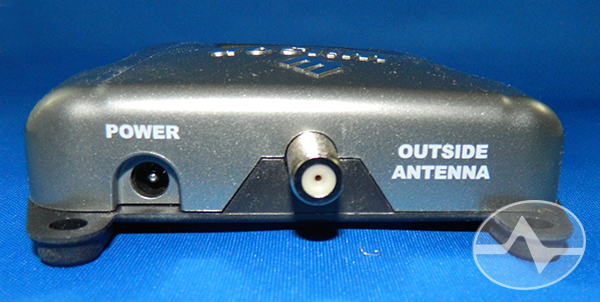 The inside antenna connects using an SMA connector. The indoor antenna can go pretty much anywhere you need it to go. It’s not designed for ceiling or wall mounting but is light enough yet stable enough to sit anywhere you need it. 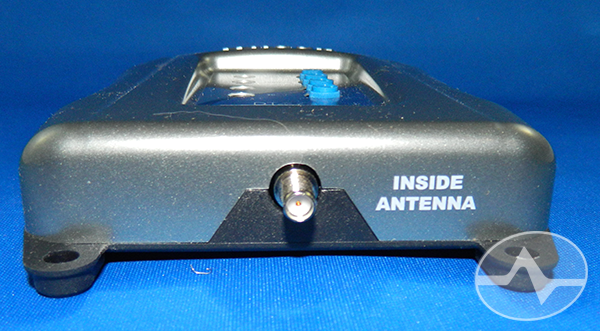 The outdoor antenna uses an F-connector and RG6 cable so that it’s inexpensive to extend its run as far as you need. Pretty much any RG59 or RG6 cable will work for this purpose; unlike the commercial Wilson boosters it’s not necessary to use expensive 50-ohm cable. 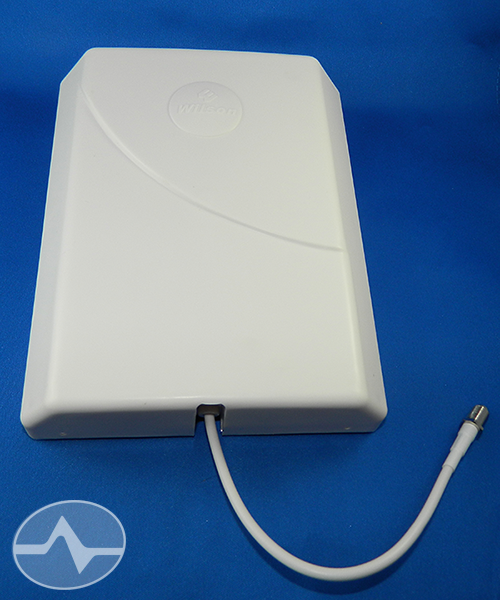 The outdoor antenna itself is a large panel and has connections on the back for mast mounting. An optional plastic shroud covers the back if you are mounting it to the inside of a window. We also received a plastic cup that can be used to mount to the outdoor antenna to a window with strong suction cups. This makes the DT4G perfect for a temporary installation. For a more permanent one, we recommend mast mounting. 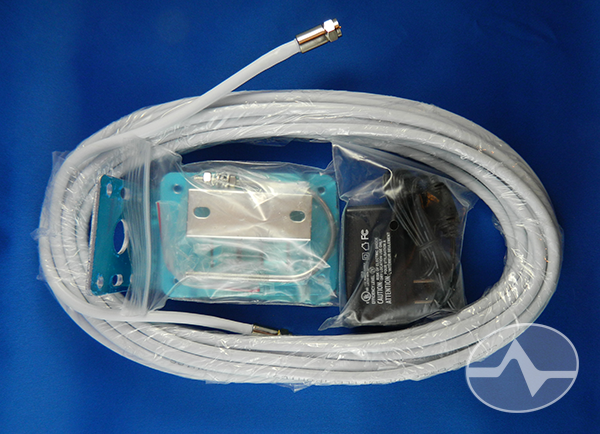 We also received a length of RG6 cable, mast mounting supplies, and a power adapter. 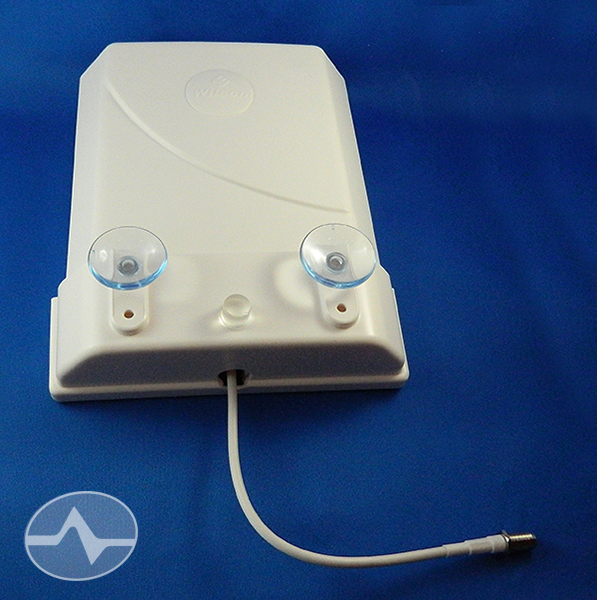 Installation is easy and simply consists of finding a place for the antennas, the base unit, and the power adapter. We strongly recommend mast-mounting the antenna if this is a permanent installation. It’s important that there is at least 15 feet of vertical separation or 20 feet of horizontal separation between the base unit and the outdoor antenna or the device may not operate at full power. In addition, you must have 18 inches of separation between the base unit and the indoor antenna. Once you have figured out where to place all the pieces, install the antenna and point it toward the nearest cell tower. There are many apps and web sites that will help you find the closest tower whether you have Android, iOS or something else. They all rely on the same public records. You can also use your phone’s test mode to try to get power readings. The antenna has a fairly wide beam so it’s not important to be very precise, just aim the antenna in the general direction of the tower. Powering up the booster you should see four green lights. If any of the lights are red, then the booster is shutting down to avoid an overload. This is generally caused by the booster being too close to the outdoor antenna. If you have a red light and the booster and antenna are as far away as possible, turn down the booster’s power by turning the screws on the front until the light turns green. You should see an immediate improvement in reception once all the lights are green. Wilson hasn’t released formal numbers as to the range of the device but it’s reasonable to think that it’s going to cover a small to medium size office quite easily. it depends on the amount of metal in the walls of course but for in-home use or a small office you’ll find this booster gives plenty of power. Unlike other boosters, the DT4G boosts all available frequencies so your phone’s signal meter won’t lie like it will with a booster that only boosts voice. You should see a massive improvement in voice quality, data speeds, and you’ll see better battery life because your phone won’t be struggling to transmit a stronger signal. This is typical of all boosters, but you should see an even more marked improvement with the DT4G because all the carrier frequencies are nice and strong. Because the DT4G works will all carriers, you’ll have no problem using it with multiple people at the office no matter what kind of phone or device they have. It should even work great with 4G or LTE-equipped tablets! Here’s the bottom line: this is the booster you’ve been waiting for, and we expect the price to be very pleasing as well. 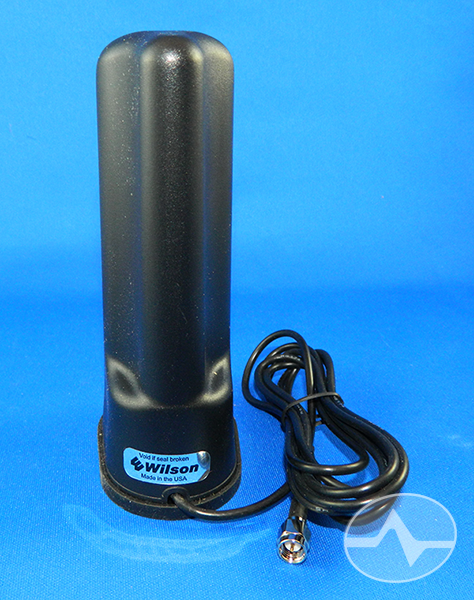 This is the only booster you’ll need for years to come, and because it comes from Wilson, you know it’s a quality design.